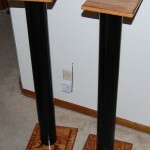 I needed some simple speaker stands for my surround speakers that didn’t take up much space. After doing a quick search online, I decided to make my own! My design was mainly based on this how-to article with a few tweaks. I joined lengths of 1×3 oak boards to form the square boards. For a pair of stands, I made four 7.5 inch squares and two 10 inch squares. One 7.5 inch square formed the top portion of the speaker stand and was rounded-over on both the top and bottom for a nice beveled edge. The four remaining squares were only rounded-over on their top edges, as they will be on the ground. 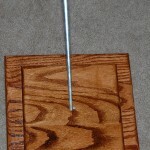 The 10 inch square forms the base, with the 7.5 inch square centered and glued on top. 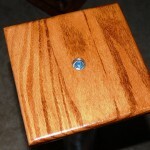 Once all the glue dried, a hole was drilled in the center of all of the squares to allow a length of threaded rod to run the height of the stand. A hole was then drilled in bottom side of the base and the top side of the top part way into the board to allow a nut and washer to be countersunk; thus allowing the speaker to sit flush on top. A length of 3″ PVC pipe was then used in between the top and bottom planks. Cutting the PVC flush was tricky without the proper tools. A hack saw resulted in a messy cut, but by drawing a line around the circumference of the pipe and starting the cut with the hack saw, our short jig saw blade was able to cut straight around the circumference. 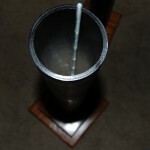 The threaded rod then goes through the center of the pipe and the nuts on each side tighten the whole thing together. Stain and paint made this project complete. 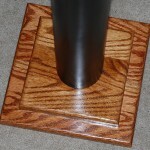 Stain (Minwax Early American) and three coats of polyurethane (semi-gloss) was used on the base and top. Plastic spray paint was used on the PVC pipe pieces. I used black to match my black speakers. I decided to add some small plastic adhesive feet to the base and some no-slip gripping material under the speaker. 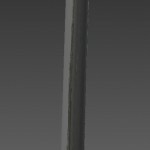 If used in an area where this stand would be prone to being knocked around, some more weight should probably be added to the base (inside the PVC pipe if possible) to prevent tipping.